I guess I’m a sucker for quirky ideas- I love this from Apartment Therapy. 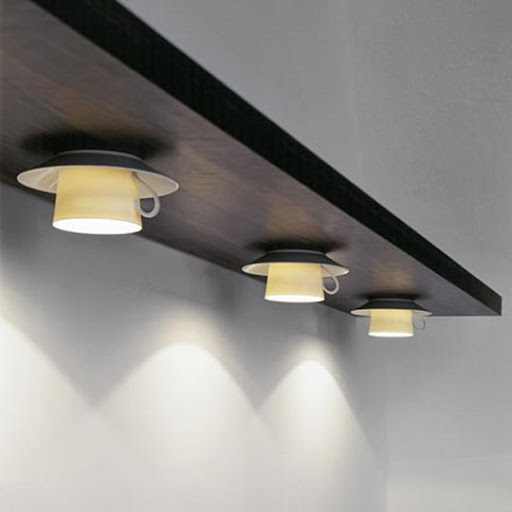 It is a great idea for a kitchen or a cafe- should be easy enough to DIY with LED lights and op-shop cup finds. It still looks sophisticated, but should make a nice talking point. If you are not into the streamlined look, you could always do a whimsical ‘shabby chic’ version with mismatched or floral teacups. Love these! Would look great in a café. Speaking of interesting lights in cafés… “Avenue Road” cafe at the top of Avenue Road, Mosman has a great collection of retro lights. In one room several 50’s floor lamps hang upside down from the ceiling – very quirky! Hi Chai!, thanks for the tip- I’ll have to check it out some time.